Preheat the oven to 200C, gas mark 6. Place the salmon in a shallow pan and pour over enough cold water to cover. Bring to the boil then lower the heat and poach gently for 10–12 minutes until just cooked through. Remove from the cooking liquid and flake the flesh. Arrange over the base of a shallow baking dish. Steam the broccoli florets for 4–5 minutes until just tender then add to the salmon. 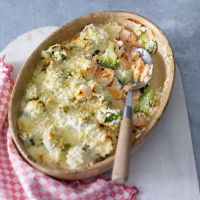 Whisk together the yogurt, egg, mustard, lemon zest and juice, season and spoon over the broccoli and salmon to coat. Scatter with the breadcrumbs and bake for 20–25 minutes until the topping is set and golden. Serve with new potatoes. This is absolutely perfect with a cool-climate Chardonnay that has finesse alongside subtle texture. It’s also organic: Domaine Begude Limoux Chardonnay, South of France.